- UL listed, Fm, LPCB approved detectors are available. - Apollo/System Sensor/EST Sensor are available. - Single station Battery backup detectors are available. - Compatible with any make Fire Alarm Panel. - Smoke, Heat, Multi-sensor detector are Available. UL listed, FM approved detectors available. Apollo/System Sensor/EST Sensor are available. Compatible with any make fire Alarm Panel. Smoke, Heat, Multi-Sensor Detector are available. 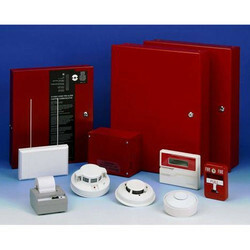 One can avail from us a quality approved assortment of EST Fire Alarm Panel. Owing to their top quality, our products are extremely praised amongst the patrons. EST AND GST MAKE FIRE ALARM PANEL. To furnish the varying desires of our customers, we are immersed in offering a world class consignment of FST Fire Alarm Panel. Mastek Integrated Systems is specialized in Fire Alarm System. Mastek is backed-up with a rapid prioritized in Supply, Installation-Commissioning and AMC Services for below products. EST, Simplex, Notifier, Morley, Bosch, Vesda, Ravil, Inergen and many more.